Findings in this study support previous research illustrating that LGBTQ youth (some of whom may also be GNC) are frequently and repeatedly harassed and bullied at school. 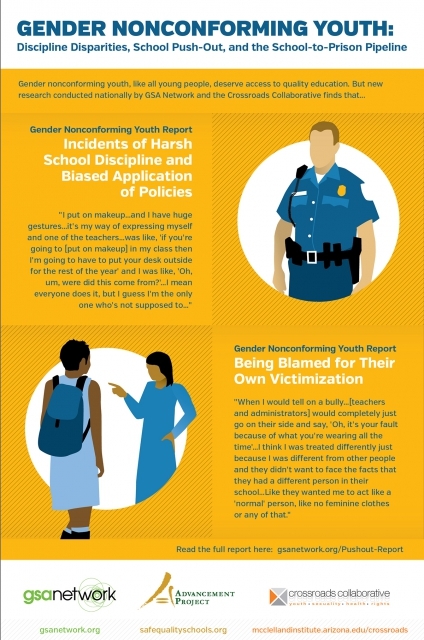 However, young people in this study overwhelmingly report that GNC youth, in particular, are regular targets of bias-based harassment and bulling at school. Participants also report that school staff do not adequately protect GNC students when bullying and harassment occur. Furthermore, in some cases school staff are even described as the perpetrators of harassment.